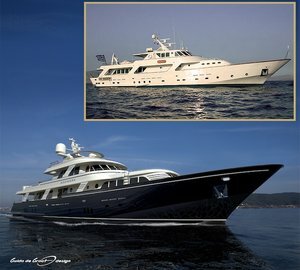 The classic motor yacht SYLVIANA (ex Ragazza, Hiba, Aruba II) is a 35.05m (115' ) vessel built by CRN Ancona in Italy in 1974. 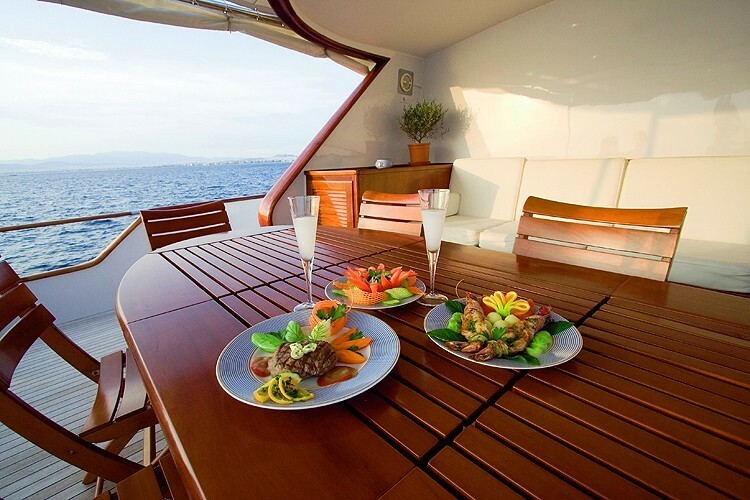 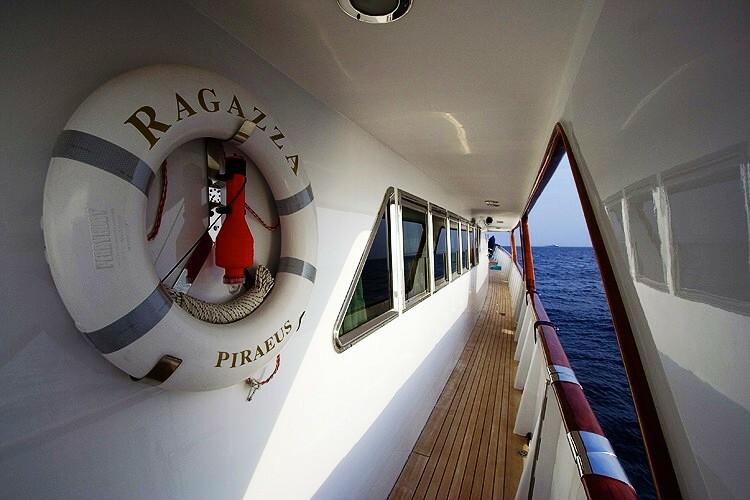 The yacht has since been refitted and meticulously maintained, with a major refit in 2015. 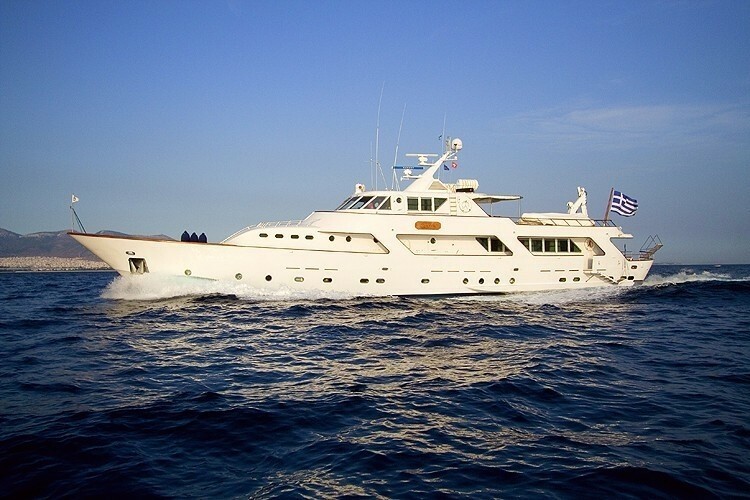 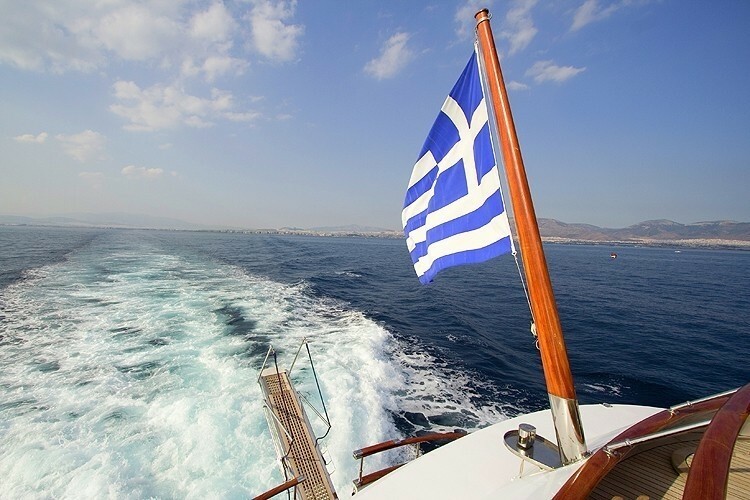 The charter yacht SYLVIANA is based in Greece year round and is able to charter with 10 guests overnight. The beautiful CRN Ancona motor yacht SYLVIANA (ex Ragazza) has an elegant salon featuring a relaxed seating area with opposing couches, a central coffee table and an entertainment centre, and a freestanding bar. 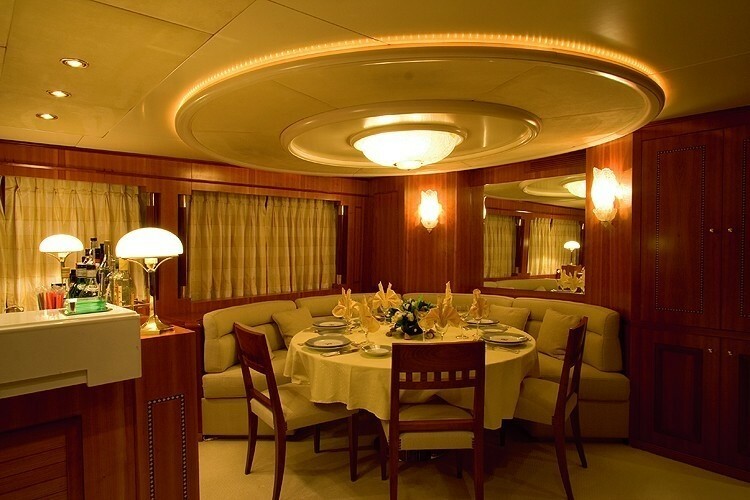 Forward of the salon is an adjoining dining area with a semi circular settee and 3 occasional chairs able to seat to total of 10 guests for formal dining. 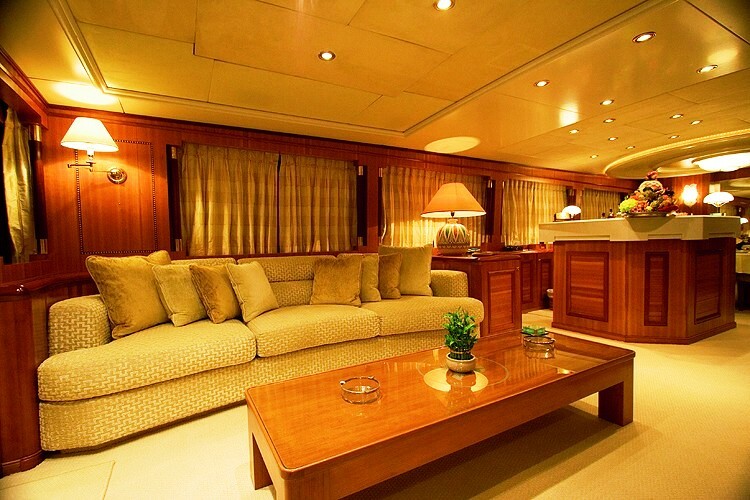 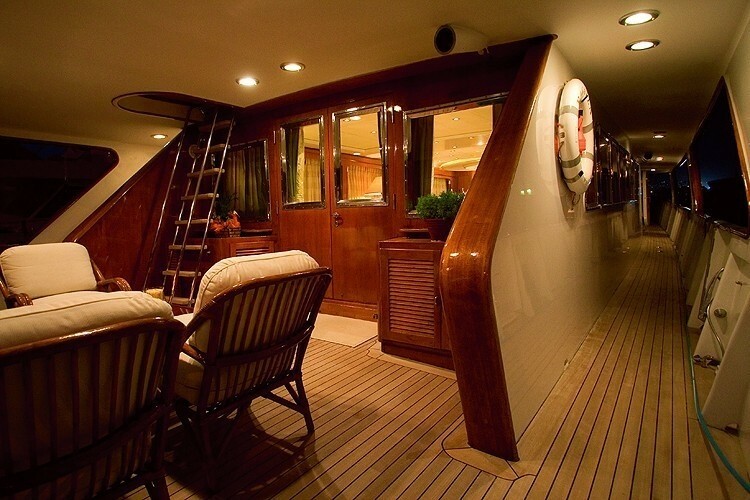 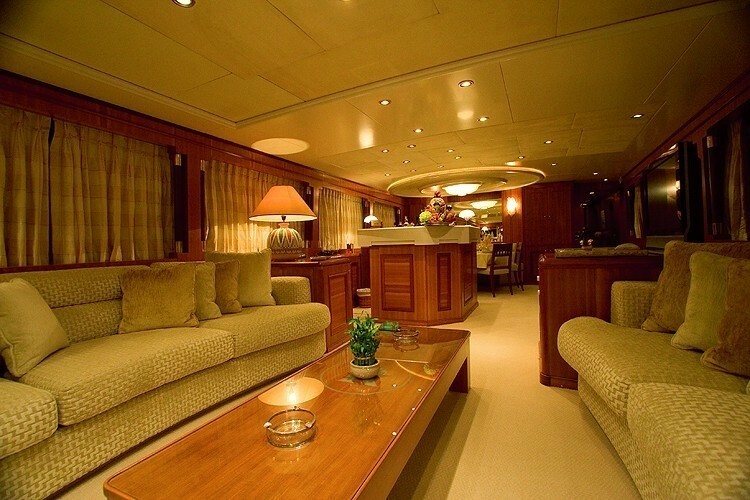 Further forward on the main deck is the galley, a wine cellar, a day head and the master suite. 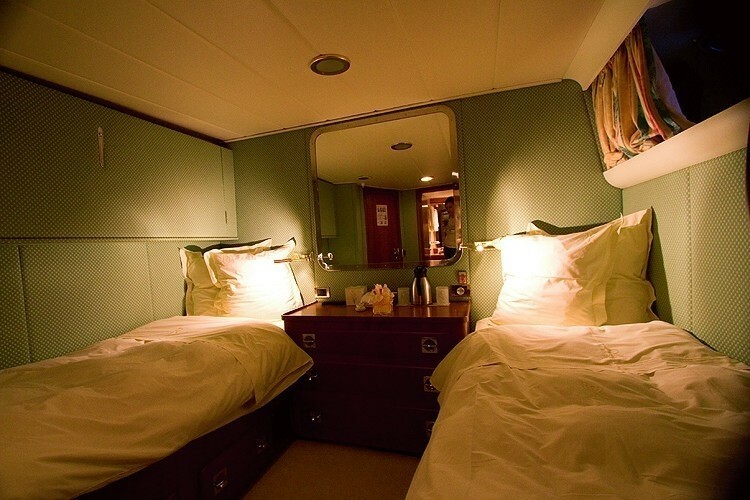 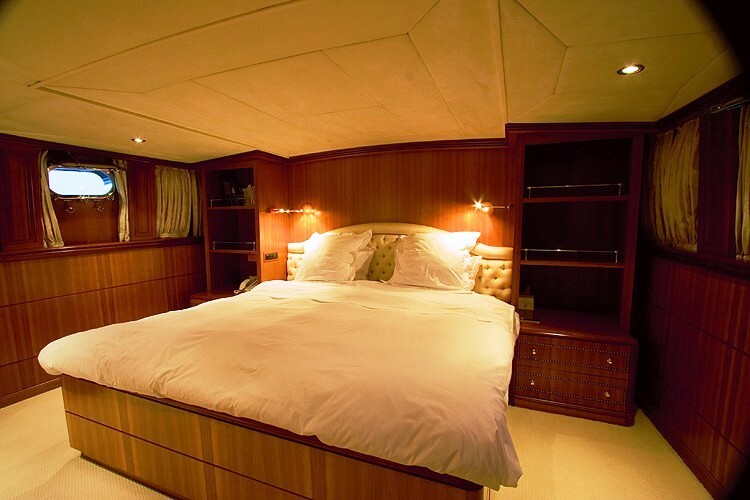 Luxury motor yacht SYLVIANA can accommodate 10 guests in a total of 5 cabins including the master suite, one double and three twins all with ensuite facilities, TV and stereo. 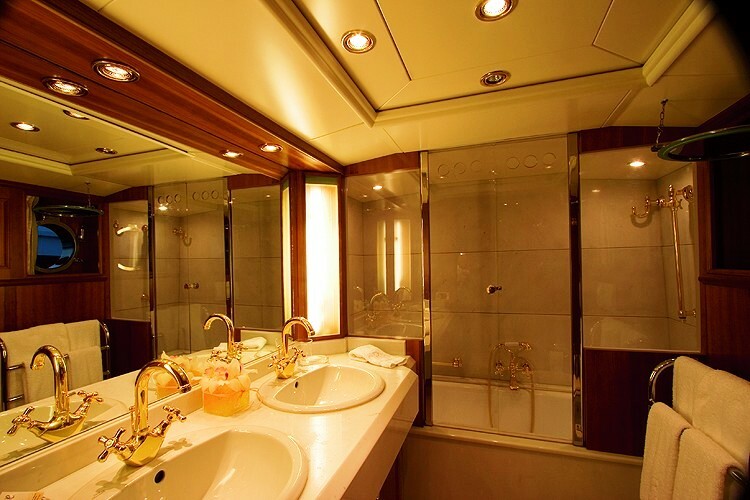 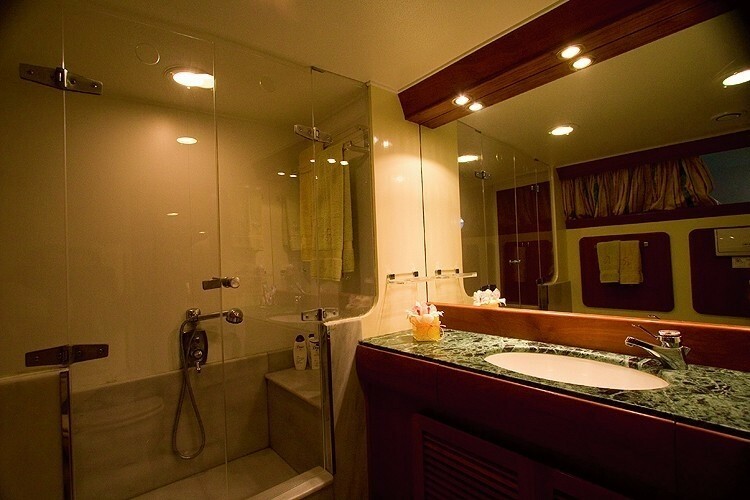 Superb craftsmanship and attention to detail is shown throughout the yacht and the accommodation quarters. 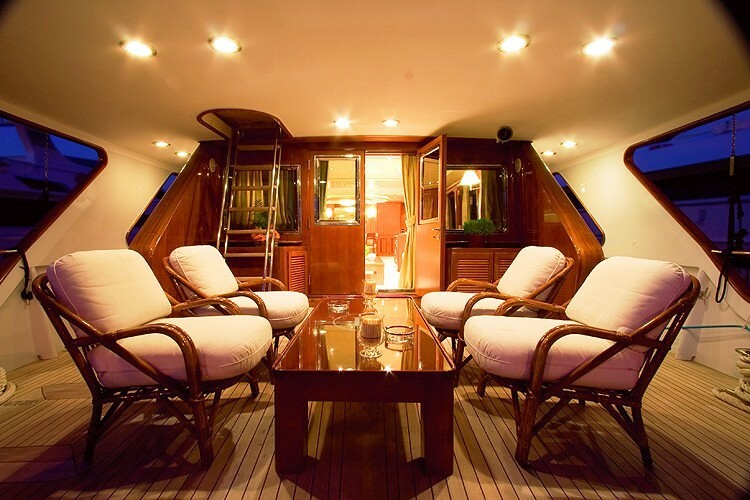 The classic motor yacht SYLVIANA boasts spacious outdoor areas including a sheltered area for alfresco dining on the upper deck, a lounging arrangement on the aft deck and cushions for sunbathing on the foredeck. 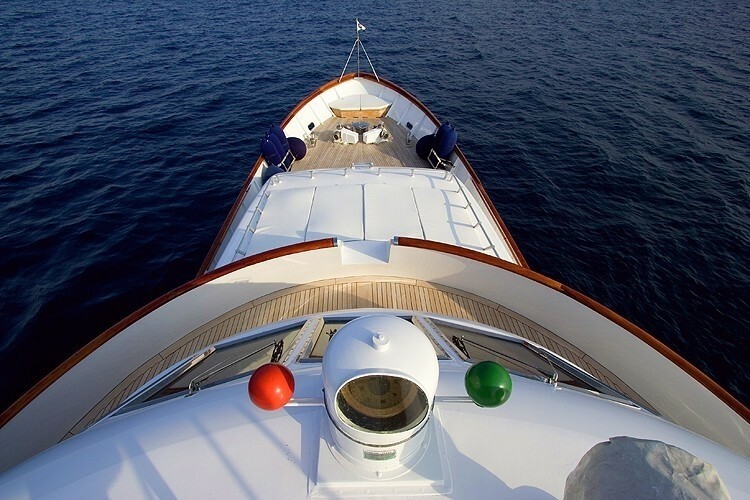 The charter yacht SYLVIANA also boasts wide walk around decks on both levels giving an extra sense of exterior space. Greece based motor yacht SYLVIANA (ex Ragazza) has a crew of 5 and is perfect for a family charter or for a group of friends wishing to explore the beautiful islands in Greece and the Eastern Mediterranean. M/Y SYLVIANA features a good selection of water sport toys for active guests including a Boston Whaler tender with 115 hp, a Jet Ski, Water Skis, a Knee Board, Tubes, a Banana, a Windsurf, Snorkelling and Fishing gear, Diving Gear, and Mountain Bikes for onshore exploration. 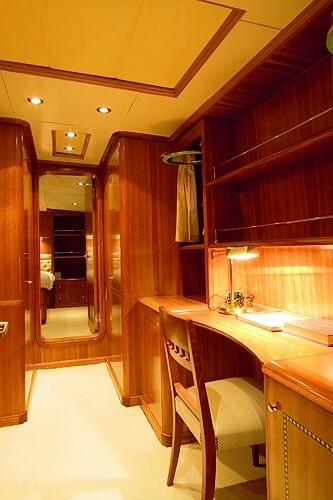 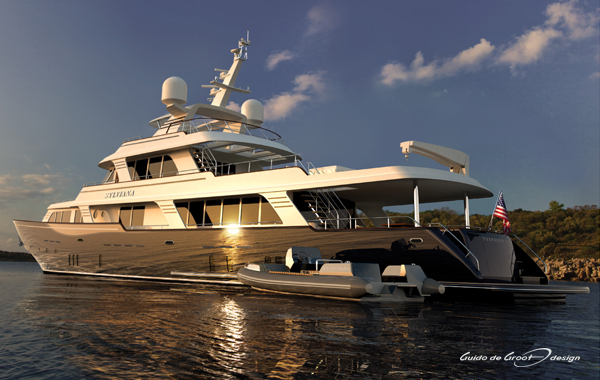 Sylviana yacht’s 2015 extensive refit includes a 4 meter aft extension that brings her to a length of nearly 40 meters. 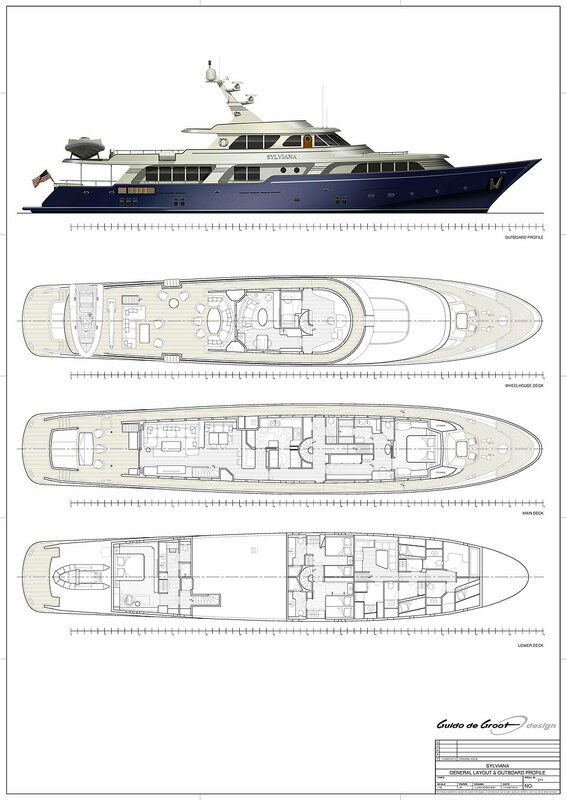 In addition to gaining length, SYLVIANA received a new modified superstructure forward on the main deck, an extended bridge deck lounge, and a completely new upper sun deck. The main focus was on ceiling height increase, and the vessel’s capacity to store larger tenders. 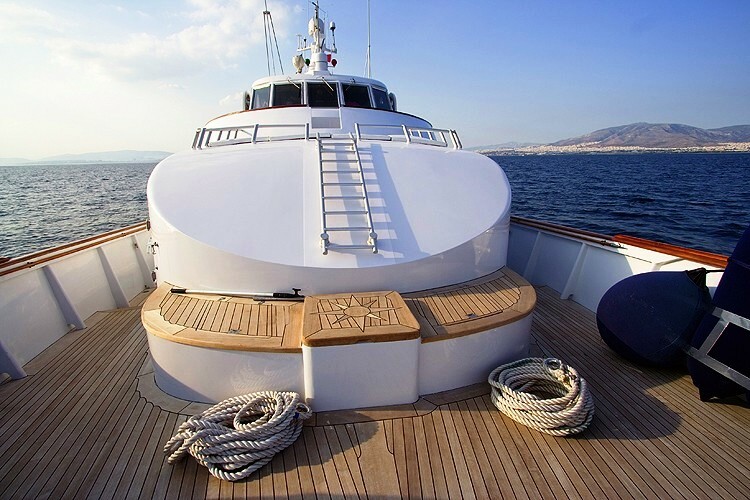 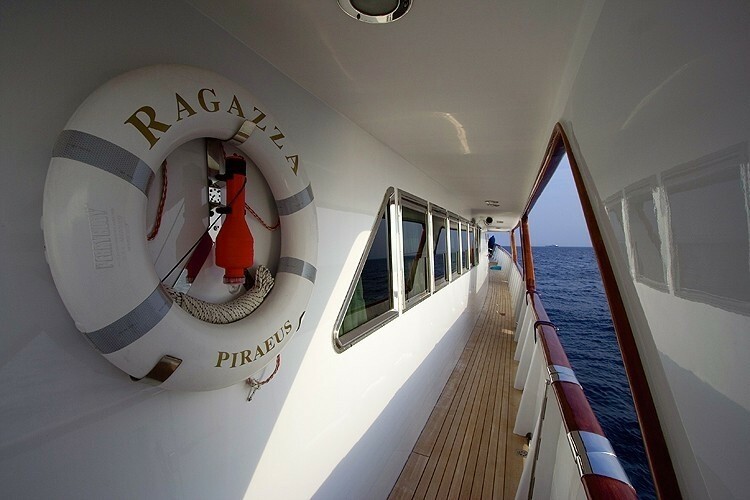 There is plenty of newly created recreational and sunbathing space aboard. 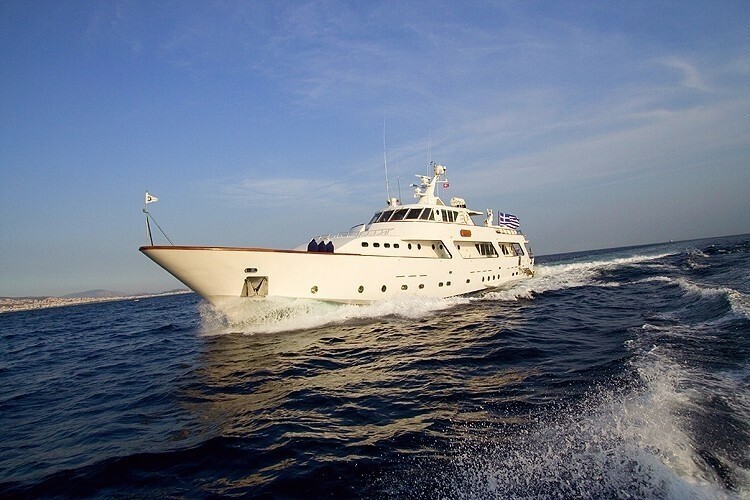 Motor yacht SYLVIANA (ex Ragazza, Hiba, Aruba II) has the following Tenders and Toys onboard: A Boston Whaler Tender with 115 hp, Jet Ski, Water Ski, Knee Board, Tubes, Banana, Windsurf, Snorkelling and Fishing gear, Diving Gear, Mountain Bikes. 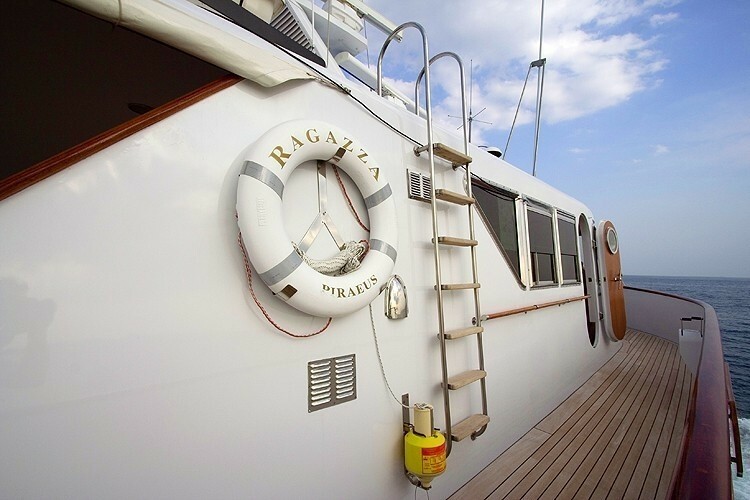 Communications include GPS, GSM, Radar, Autopilot, Depth Sounder, GMDSS, Weather Fax. 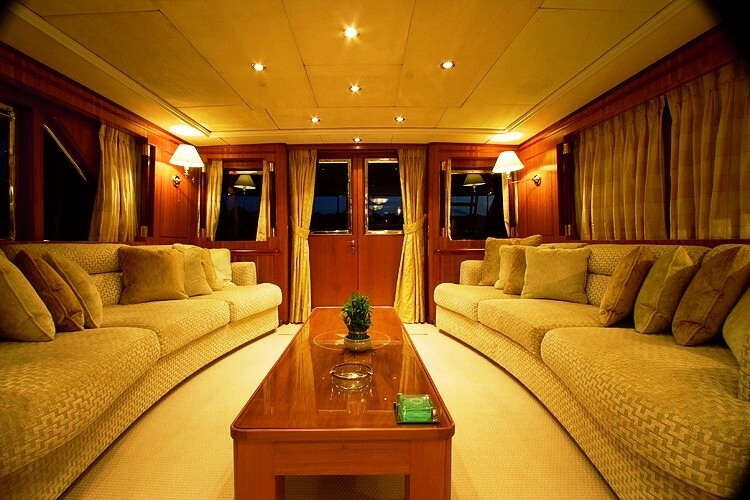 Audio Visual Equipment and Deck Facilities include Sony Music System Throughout, Flat TV – VCR in saloon, DVD, CD player.